Checked with Bitdefender The program was checked for malware with Bitdefender and is clean. See a detailed security report using the link below. A simple local network (ad hoc) - that can be used to connect computers for file transfer, sharing services/programs, or hardware resources such as printer between the computers on the network. A local network with Internet access - used to share an Ethernet LAN, wireless, or 3G / 4G / 5G modem Internet connection with all the connected devices (PCs, smartphones, tablets, etc. ), keeping every benefit of an Ad hoc connection. For example, it's possible to share the LAN (Local Area Network) or a USB modem Internet connection with up to 100 computers, tablets, smartphones, etc. Available in multiple languages: English, Romanian, French, Polish, Vietnamese. Detects fastest Internet connection automatically. Shares the PC Internet connection with all types of portable devices (smartphones, tablets, smartwatches, smart TVs). Can be used as a substitute for the internal GUI interface 'Create an ad hoc network' existing in Windows Vista and 7, but not in the latest versions, such as Windows 8, 8.1 and 10. No need to keep the program active in the memory - once a hotspot is created, the application can be closed without halting the Wi-Fi network. The hotspot can be stopped either by relaunching the program and pressing the Stop button or automatically at the system shutdown. Provides what other similar programs don't: the ability to set a manual IP address for DHCP (by checking the box 'Self-assigning IP address...', in the Settings tab) - when the Windows OS can’t configure this service properly. So, if you face difficulties while creating a hotspot with other programs or using Windows interfaces/commands, then you should try Virtual Wi-Fi. Wireless technology is the most practical way to interconnect a wide variety of devices which include computers, smartphones, tablets, smart TVs, etc. The most important advantage of wireless technology for PCs is that it connects numerous devices without the need to use special adapters or cables. Even a few years ago, to create a wireless network, also called Wi-Fi network or hotspot, there was a need to use a physical router. Afterward, the producers of wireless adapters embedded the functionality to create hosted Wi-Fi networks, and this fact led to broad connectivity between computers and other devices. 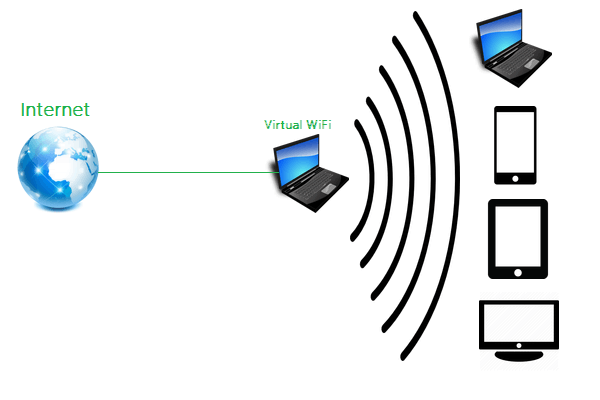 The Wireless Adapter Card that can host a Wi-Fi network could, therefore, be seen as a virtual wireless router. The OS and software developers utilized this new feature for both hardware and software purposes, and as a result, various third-party programs and internal interfaces have been included in the OS to manage virtual Wi-Fi networks.